Wolves boss Nuno Espirito Santo says that the win over West Ham is their reference point for the rest of the season. Nuno Espirito Santo hailed Wolves' last-gasp 1-0 victory at West Ham as a "massive" result for the club before dedicating it to the fans. Adama Traore's stoppage-time strike was enough to secure Wolves their first top-flight win since beating QPR in February 2012. 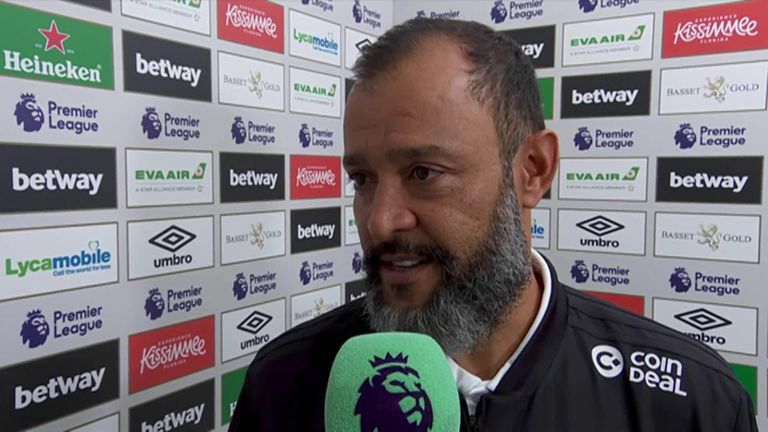 Nuno, speaking to Sky Sports following his side's win at the London Stadium, thinks the win is another step in the right direction for his side. "It feels good," he said. "Even if we didn't win I would be happy because we worked hard. "We are happy and for our fans, it's massive, to come here and get three points." "It means more for our fans. The way they travel, the way they celebrated at the end of course it's special because it was a tough game. "It's one step more in the way we want to go." Wolves' winner came in the third minute of stoppage time when Carlos Sanchez lost possession to Ruben Neves. Two passes later, substitute Traore had the ball in the net, much to the delight of his manager. "The moment of recovering the ball with two minutes to go was huge," Nuno said. "After 90 minutes one of our midfielders went high to press and won the duel. "We know about West Ham on the counter-attack, with the speed of the players, but we were fortunate to get on the counter-attack with the high pressing of Ruben and deserved it because the boys worked hard." Victory sees Wolves move up to ninth in the table on five points but despite their solid start to the season, Nuno is eyeing more improvements when the players return from the international break, saying that the win over West Ham is their reference point for the rest of the season. "Sometimes you have to be more clinical," he said. "This is what we will look for in the next game. "Now we have international break. The boys in their national teams go and the way we worked, this is our reference point for when we come back. "Now is the moment to look at the first few games, the way we started and the way we prepared in pre-season. The things we are doing means the work was well done but we still have to improve. "Now, let's work hard on other aspects of our game."